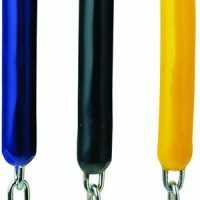 This 3/16″ proof steel coil chain hangs sturdy on your playground swing set. Choose between lengths of 5-1/2 feet and 8 feet. NOTE: These chains are sold individually. To hang a standard swing, you will need 2 lengths of chain. To order 2 lengths, please enter “2” in the “Quantity” box above, then click “Add to Shopping Basket.”) Choose your length and quantity and buy online today! If you are also looking for a great swing set seat, check out the ADA Adaptive Seat with 5 point harness. 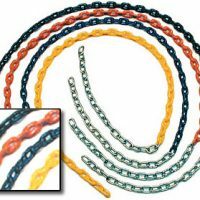 This 3/16″ proof steel coil chain hangs tough on your playground swing set. Choose between lengths of 5-1/2 feet and 8 feet. These chains are sold individually. To hang a standard swing, you will need 2 lengths of chain. To order 2 lengths, please enter “2” in the “Quantity” box above, then click “Add to Shopping Basket.”) Buy online now! !